Waheguru Ji Ka Khalsa, Waheguru ji Ki Fateh! Welcome to the wonderful LIVE Kirtan and Prayers from Golden Temple! Each day becomes blessed as we connect to Guru Ji, even for a moment! 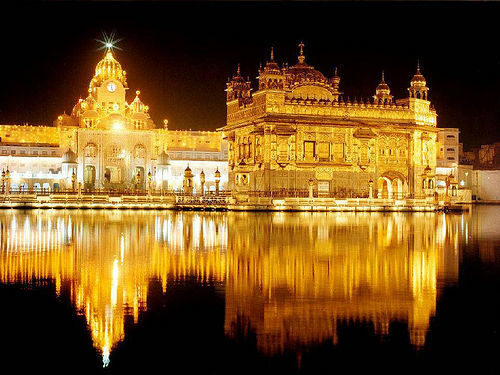 "Watching the LIVE Kirtan from Golden Temple, Harmandir Sahib here everyday, makes my lonliness, pain and sorrow go away.. it does not seem that I am sitting here in London, but it seems that I am sitting in the lap of Guru Ji in Amritsar! Thanks to theSikhChannel.TV "
Bhul Chuk Di Maffi: We are sorry that the Video feed is not working anymore as we are unable to pay the the large amount of money needed for the Licence Fees as we are short of money. We have lots of people visiting us daily to enjoy the LIVE Kirtan but most of them are young Sikhs who are still studying or unemployed. Thank you for your generous contributions, to help us serve you and the community and the whole world for many more years to come. May Waheguru Ji Bless you. Till we get enough Donations and funds to get the Video feed on again, please enjoy the LIVE Audio Kirtan from Golden Temple from about 3am to 10 pm daily (Indian Standard Time) or enjoy any of the other Sikh channels on the menu on the right. To help us continue these services => please Make a Donation to contribute your Shabad Betha : http://tinyurl.com/Daswand and be blessed... Thank You very much from the bottom of our hearts... May you be Given back many times more. To get the Daily Hukamnama from Harmandir Sahib, Golden Templ and more.. please fill in the form below and Click "Submit Your Information"
This Audio Feed from Golden Temple, Sri Harmandir Sahib comes LIVE daily from 3am to 10.30 daily, Indian Standard Time. Thanks to SGPC, the Great Ragi Jathas who spend their time and lives practicing and perfecting Kirtan, the technical, administrative and other staff who make this possible, and most importantly to You, the Sangat who make all this possible.. May Waheguru Ji's bountiful and beautiful be on you all the time. We serve more than a 225,000 young people all over the World and we need your help ... please Donate any amount you like (one time Donation Only) to Help Us keep this service going on for many more years to come. Click here for a One time Donation of Any Amount You Like Click here for a One time Donation of Any Amount You Like A Heartfelt Thank You for your Kind generosity. May Guru Ji Bless You in Everyway. Sometimes the volume of our own emotions runs so high that it's hard for us to hear God's words ourselves. At those times, it may be helpful to receive God's words through a neutral source. While we encourage everyone to try their own hand at doing Ardas & asking God questions, we also want to give help when it is asked for. Waheguru Ji will bless you .. Please Donate any amount you like to Help Us keep it going for many more years to come. A Heartfelt Thank You for your Kind generosity. May Guru Ji Bless You in Everyway. The Story of Vesakhi by BBC... Like, Share, Comment & Click to watch it now on http://theSikhChannel.TV Happy Vesakhi to all!